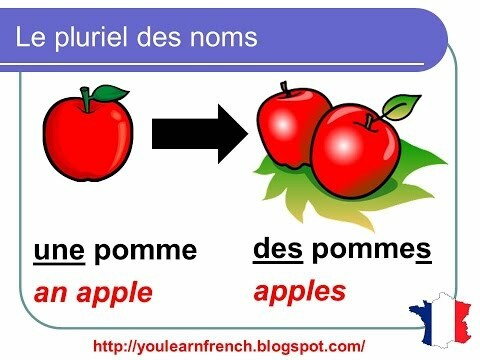 In French, just like in English, to make most nouns plural, you simply add -s at the end. J'ai un enfant et mon frère a trois enfants. I have one child and my brother has three children. Il y a deux ballons bleus et un ballon rouge. There are two blue balloons and one red balloon. Je vois un petit chien et deux grands chiens. I see a small dog and two big dogs. 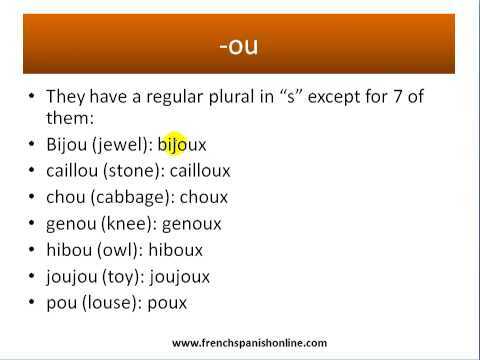 Note that you don't pronounce the plural -s in French. If a noun already ends in -s or -x or -z in the singular form, then it remains unchanged in the plural form. Je vois une souris ! Je vois deux souris ! I see one mouse! I see two mice! L'écureuil a une noix... non, deux noix ! The squirrel has one walnut... no, two walnuts! Mon nez est petit, mais leurs nez sont gros. My nose is small, but their noses are big. ses jours de congé: I'm doing one of your translation tests - why is there no S on congé please, even though it's jours with an s? Thank you! there's no s because congé is not an adjective but a noun. Jours de congé -- days of vacation. If you said instaid "jours congés" it would be an adjective and hence also pick up the s. The difference lying in the preposition "de".
" le chien - les chiens " The sound clip's saying a whole lot more than just that. What's she actually saying betwen le chien and les chiens? Hi Crystal - that was a bug. It's fixed. Thanks for letting us know!